Salt Lake City, UT — On August 11, 2014 Dillon Taylor was gunned down in broad daylight by Officer Bron Cruz. The confrontation happened because Cruz confused Taylor with a possible criminal in the area. Taylor, his brother, and his cousin were exiting a 7-Eleven in an area where police were searching for a suspect who had allegedly been waving a gun around. These uninvolved young men allegedly matched the description. Barely 40 seconds go by from the time Dillon is approached until he is shot by Cruz. The body cam footage was released in September of last year, however, it stopped just after the shots were fired. Apparently the department did not want you to see what happened after as the full video was not released until this week. 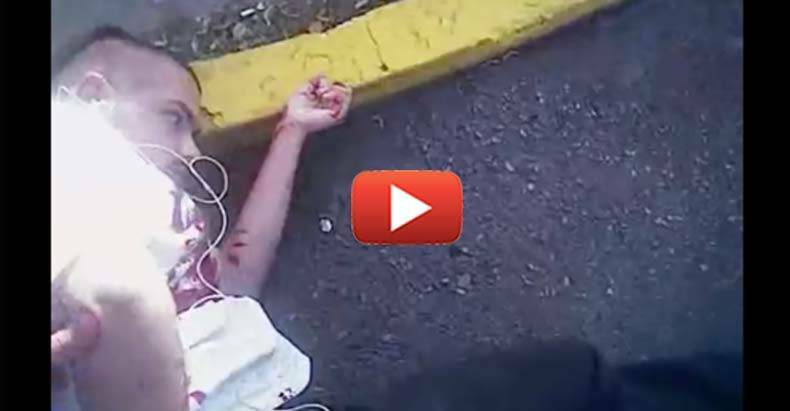 It shows the disturbing moments before and after this innocent man was gunned down by police. Now that the full video has been released, it’s disturbingly clear that nothing about this police shooting was justified. Nothing at all. At 0:17, Officer Bron Cruz gets out of his vehicle. You will notice people confused by his presence. At 0:22, Officer Cruz walks past two men who were friends with Dillon Taylor. At 0:24, Officer Cruz walks behind Taylor, who has on a white T-shirt and is listening to music. At 0:33, we see the officer has his gun drawn and is yelling at Taylor, who’s holding his sagging pants up and does not appear to hear Cruz. At 0:36, the officer shoots Taylor. It would be fatal. Starting at 0:41, you will notice the headphone cord coming out of Taylor’s pocket. At 0:48, you will see that the headphones were clearly going up to Taylor’s ears. At 0:52, the officer asks Dillon to “give me your hands,” but Taylor is already near death. His friends begin screaming and crying in the background. At 1:03, the officer handcuffs Taylor. At 1:48, the officer turns Taylor over, the headphones are visible, and the officer states “it’s clear”—meaning that Taylor was actually unarmed. At 2:54, the officer turns Taylor completely over, keeping him handcuffed, and begins talking to him and trying to get him to talk. Taylor appears nearly dead and is completely covered in blood. At 4:56, the officer is rummaging through Taylor’s pockets instead of providing any first aid. It seems that after the officer discovered Taylor was unarmed, he pretended to care and provided a nice show for his body cam. However, he never once attempted to simply apply pressure to the gaping hole in Taylor’s chest. WARNING: The video below is graphic and disturbing.